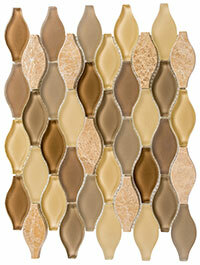 Glazzio Tiles stocks a large range of different color styles and sizes. Any item, which is not in stock can be custom made to suit your taste and requirements. Therefore Glazzio Tiles always recommends that tiles not be purchased from an image of any kind. ** In order to avoid stains and discoloration as well as to prevent grout from getting into the pores of the tile; all Crackled Glass, Crackled Glaze and Stone products should always be sealed prior to grouting.